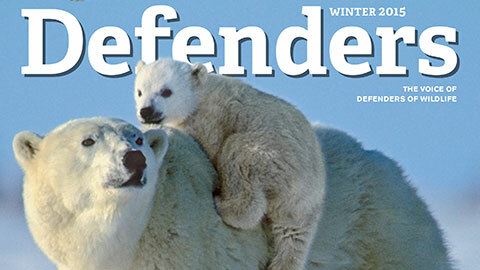 Home | Learn About Wildlife | Defenders Magazine | Winter 2013 | Got Bears? When the weather turns crisp and the sweet smell of apples and plums wafts to the upturned snout of a grizzly bear bulking up for winter hibernation in Montana, it’s a sure bet the bear will follow his nose. What’s happened is that after decades of hanging on by a thread, grizzly bears are finally recovering thanks to Endangered Species Act protection. By the 1970s, the population had been reduced from an estimated 50,000 to 100,000 to a precarious 400 living in less than 2 percent of their historic range. Today, about 1,600 grizzlies roam five of the six federal recovery areas. That’s good news for the bears and the ecosystem, and it’s exciting for people who want the bears out there—although they don’t necessarily want to see them in their yards and orchards. With the goal of keeping bears alive and people safe, Defenders has invested some $400,000 in more than 100 coexistence projects in the West. To deter bears from bee yards, garbage, sheep herds and chicken coops, Defenders has spent more than $50,000 on miles of electric fencing projects alone and also assists in the costs of bear-resistant garbage containers, campground food-storage lockers, livestock-protection dogs and range riders, who keep grizzlies away from livestock herds. In cases where livestock is lost, Defenders’ Grizzly Bear Compensation Trust reimburses livestock producers at 100 percent market value for verified losses to grizzlies and at 50 percent for “probable” losses. In fact, in September alone several grizzlies were either relocated by wildlife officials or killed by homeowners after they were caught killing chickens. None of the homeowners had installed the protective electric fencing. It’s these sorts of deaths that the Muth’s want to help prevent. So when their trail cameras captured a grizzly feeding on a plum tree in their front yard in September, they decided to install electric fencing around their farmstead and barnyard with the help of Defenders and Montana Fish Wildlife and Parks. “Laurie and I feel that a few destroyed fruit trees are a small price to pay to be able to witness the great bear’s return,” says Bob. But they also want to discourage the bears from becoming dependent on a food source that could make them too habituated to people—which could lead to a bad outcome for the bears. “We are blessed to live in a place large enough and wise enough to be part of this breathtaking animal’s recovery from the road to extermination—thanks to farsighted conservationists and the Endangered Species Act,” he adds. Most funding for wildlife comes from the Farm Bill, which funds project like those that create habitat for ocelots. Named for their white whiskers—which actually look more like mustaches than beards—these seals appear almost dashing. Unfortunately, looking dapper isn’t keeping them out of danger. Is climate change causing the arctic food chain to unravel? Approaching solar energy “Smart from the Start” means we can fight climate change with fewer risks to wildlife.